Hello sparkly teeth! Colgate Kids Toothpaste helps your kids have a healthy smile by making dental hygiene fun. Specially designed for kids ages 2 and above with yummy Bubble gum fruity flavour it helps to keep your child excited and incorporates good oral care habits. Your child will not only grow up with a beautiful smile, but also with healthy habits that can last a lifetime. It is Colgate's No. 1 brand recommended by dentists. 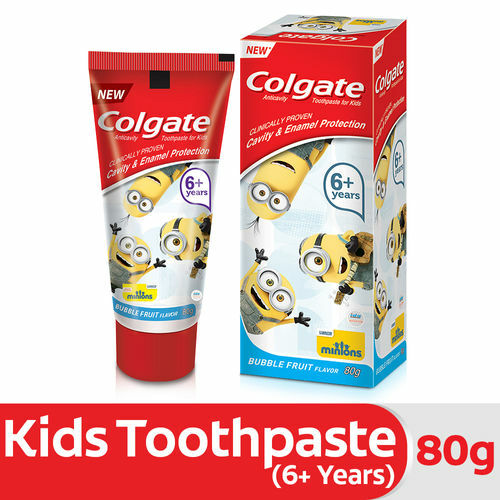 It comes with Fun Minions characters on a convenient stand-up tube with flip-top cap that encourages kids to brush.